1 كغ | كيلو من السبائك الفضية لفالكامبي Valcambi Suisse 1 kg | Kilo Silver bars offer excellent investment value. All Valcambi bullion products are federally authenticated pre-market for your protection. 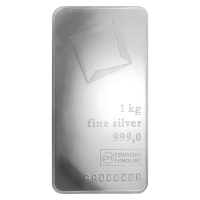 These 1 kg silver bars offer superior security features such as serial numbers and certificates ensuring solid investment potential. Paired with a reliable hedge against inflation and worldwide recognition for easy liquidity, Valcambi silver bars are an excellent way to build your wealth in ounces.